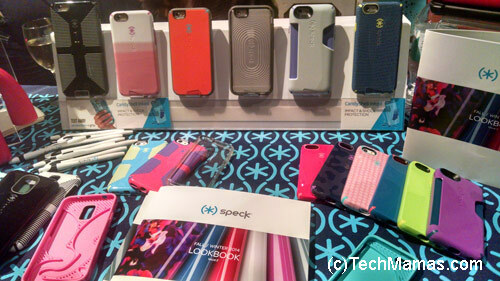 At CES and holidays I am always excited to head to Pepcom events to check out the new technology related products out. On the night of the World Series I braved the traffic to head to San Francisco for the Pepcom Holiday Spectacular. Because the holiday season is so busy I have not had a chance to review any of the products but here are some of the interesting ones in the family technology area. 24/7 is a medical grade sleep and activity tracking application, their new new features include giving users more insight into their sleep than ever before. ArcSoft will be showing Simplicam powered by Closeli, a home monitoring solution with facial detection. 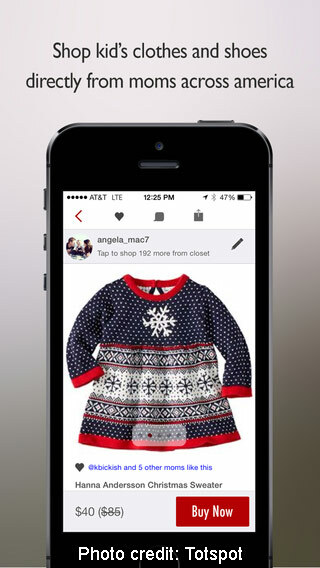 They also had information on Perfect365 – which uses Face Detection technology to scan a photo and automatically map a person’s eyes, nose, cheeks, mouth and hairline. Then photos are treated with touch-ups, using nearly 20 tweaking tools that whiten teeth, brighten eyes, remove blemishes and other editing. They can also choose from dozens of pre-set makeup templates. Belkin International showcased a great selection of holiday tech products from its three brands, Belkin, Linksys and WeMo. 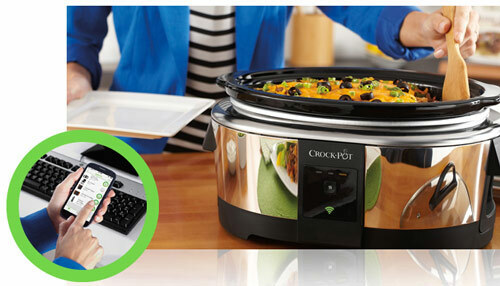 I was especially interested in their WeMo family of products that offers home automation, such as in a remote controlled Crock Pot! 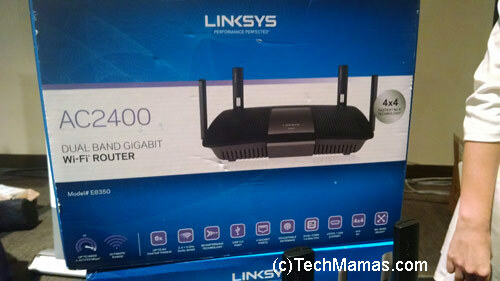 I also learned about their Linksys Dual Band WiFi router and how I could possibly swap that out for the default router my home WiFi provider gave us to help power up our wireless reception (and maybe also using a WiFi extender to help rooms far away from the router). Channel Master debuted new features and services for the DVR+ platform, as well as a new ultra-low-cost outdoor television antenna. They were also the most popular table because they had the World Series on! Channel Masters new features for its subscription-free DVR+ include YouTube access and an enhanced DVR feature to record only new episodes of a series. The company also added the new low-cost STEALTHtenna to its metro/suburban-centric Everyday Series antenna line along with a consumer-friendly Antenna Selection Guide. Coming in November, the YouTube streaming feature will appear in the DVR+ program guide. Cobra Electronics showcased “the addition to the company’s Drive HD Dash Cams series, Cobra CDR 825, utilizing a 2.7 inch screen, the largest in the dash cam family, along with the ultra-compact Cobra JumPack, a pocket-sized, portable charger for mobile devices and vehicle jump-starter.” Cobra also displayed some Walkie Talkies that I know my boys would have loved to try. 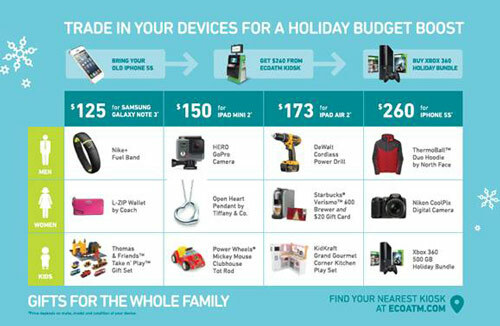 ecoATM showed their “automated e-waste recycling kiosk that accepts cell phones, tablets and MP3 players from consumers in exchange for instant cash.” Listed below is an image they shared on what you could buy for holiday gifts from what you get back from trading in specific devices. I have not tried the service but I think trading in old devices are a great way to earn money to buy new devices instead of them sitting in a cabinet collecting dust! ecoATM, the nationwide network of 1,510 automated recycling kiosks, give’s users instant cash for their phones, tablets and MP3 players. Fitbug Orb is a fitness, sleep and activity tracker. They unveiled Kiqplan, a library of interactive coaching programs that use activity data from almost ANY activity tracker, smartphone or watch to build actionable 12 week plans around specific wellness goals. Fujitsu showcased their ScanSnap product lineup, including the new mobile and completely wireless scanner, the ScanSnap iX100. Included in the ScanSnap family line is the ScanSnap iX500 desktop scanner. Kingston Technology showcased holiday gifts ideas including the MobileLite G2 wireless media reader, SD and Micro SD cards and a HyperX Cloud gaming headset that offers extended hours of game play. KODAK PIXPRO featured cameras and wireless devices including the new SP360 Action Cam, an HD action cam designed to capture 360-degrees of video without the need for multiple cameras. 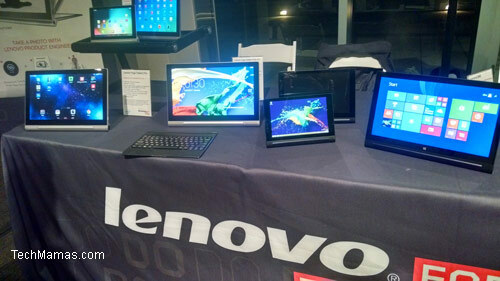 Lenovo had a few tables filled with their newest devices. Some of the devices I spent time looking at where the Lenovo Yoga Tablet 2 and Tablet 2 Pro, B40 All in One, Y50 Touch mobile gaming and multimedia notebook. 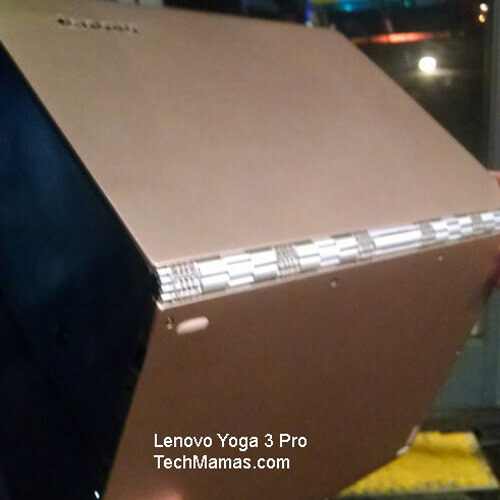 But the one I drooled over was the Lenovo Yoga 3 Pro because it has powerful features but is thin, light and so fancy! LifeTrak showcased their line of wearables, including the new LifeTrak BRITE R450, that features light exposure monitoring, smartphone notifications, advanced sleep monitoring and fitness tracking, is waterproof and requires no recharging. The battery used for the device is a watch battery! Logitech will be showcasing its latest in gaming, music, tablet, Harmony and PC accessories. The new iOS app TWINE “makes short split-screen videos. 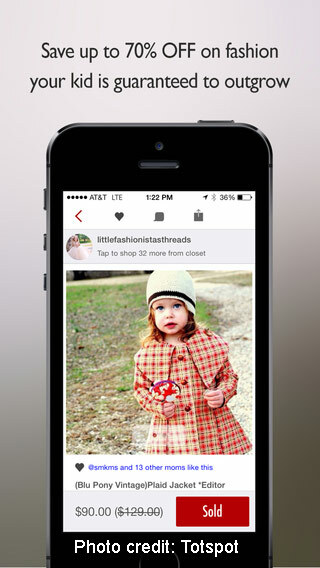 Capture opposite or parallel moments in time and TWINE automatically stitches them together“. OtterBox will be showcasing protective cases for the recently released iPhone 6, GALAXY Note 4 and more. Parallels Access app (for iPad, iPhone, Android tablets and phones plus Kindle Fire) “lets you access everything on your PC or Mac just like it was made for your touch-based device (a way to run Windows on your Mac without rebooting). 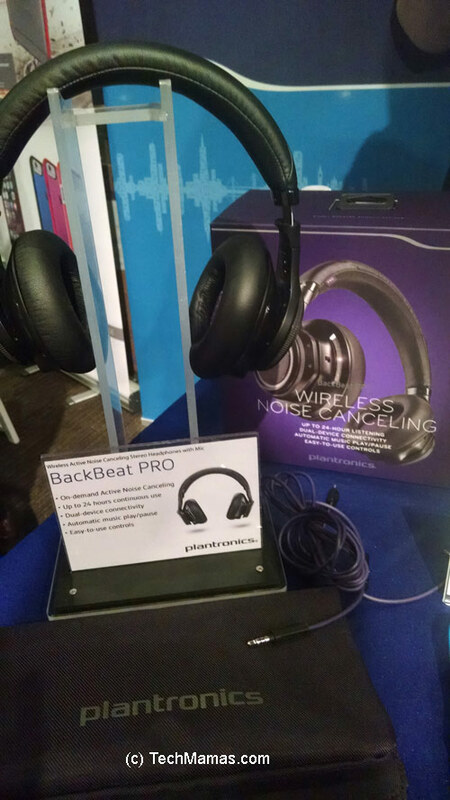 Plantronics will be showcasing its new line of consumer, stereo and Bluetooth products including the new BackBeat PRO – wireless, active noise canceling stereo headphones with mic. RadioShack has the latest in sound, toys, power and smart tech for gifting or for upgrading your own tech this holiday season. I went to the press event to celebrate the interactive remodel of San Francisco Bay Area (and other locations) Radio Shack stores. I was really impressed with the selection of tech in the new design. Especially their DIY section that had so many DIY tech projects that my boys could keep busy for a long time! S+ by ResMed: a non-contact sleep system that monitors, analyzes and provides personalized feedback to help improve your sleep from the first night. simplehuman builds smart home-tech that is “simple, functional, and built to last“. 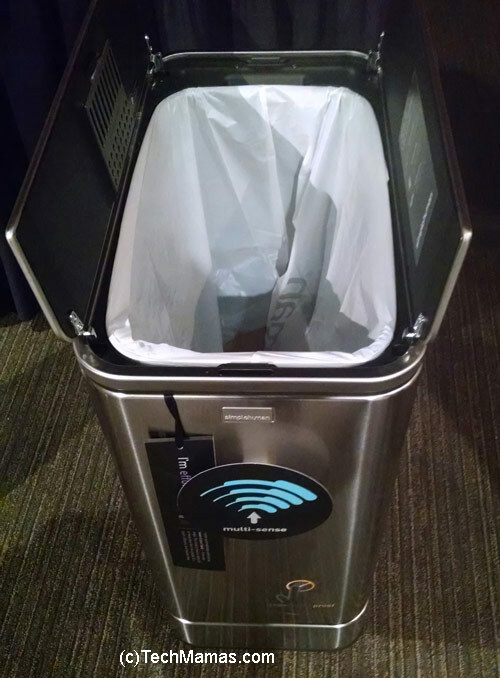 I tested the sensor trashcan they had on display and it really was able to tell the different between me waving my hand to open the trashcan versus just walking by. The other brand sensor trashcan I tried kept opening up when I would just walk by it.. Next time I will try simplehuman! As a leader in slim protective cases for mobile devices, Speck will be showing its latest bulk-free cases in smashing good looks. Their candy shell smartphone cases have been great protection in the past when I dropped my phones (just a few times…). TiVo showcased the TiVo Roamio OTA, the over-the-air DVR and TiVo Mega. TripIt booth is a trip planner keeps travel plans in one spot with features such as custom itineraries, sharing features, travel alerts, alternative flight info, flight refunds and a travel dashboard. 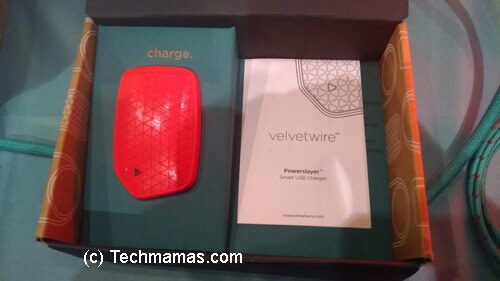 Velvetwire showcased the Powerslayer Blu – an Bluetooth-connected charger with built-in software that “reduces energy waste and promotes battery health”. ZAGG Inc highlighted their newest accessories for protecting and enhancing handheld electronics. “InvisibleSHIELD GLASS and HDX: Features HD clarity and 3X greater shatter protection for even industry-leading smartphone glass. GoLite power series: A family of portable batteries will charge any device that utilizes a USB, including smartphones and tablets. Disclosure: This is coverage of a tech press event.